t*rexes and tiaras: Tuesday Titles 033: Three Amazing Things About You..
Tuesday Titles 033: Three Amazing Things About You..
Flo has a dilemma. She really likes Zander. But his scary sister won't be even faintly amused if she thinks Zander and Flo are becoming friends - let alone anything more. Tasha has a problem. Her new boyfriend is the adventurous type. And she's afraid one of his adventures will go badly wrong. THREE AMAZING THINGS ABOUT YOU begins as Hallie goes on a journey. A donor has been found and she's about to be given new lungs. But whose? Anyhow. Jill Mansell is always going to be up there, for me, with my favourites. I knew as soon as the book came through my letterbox on Saturday morning, that it was getting bumped up the to-read pile. By Sunday teatime, I had that warm, fuzzy feeling in my heart as I made myself a cup of coffee and got back to what I *should* have been doing all weekend. 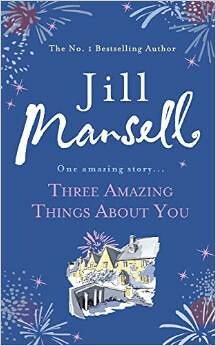 Three Amazing Things About You is similar to Mansell's other books in that there are plenty of quirky and relatable characters (and some not so likeable ones). For the first few chapters it can be hard to keep tabs on them all. Of the three main characters, I found Hallie the most intriguing and her story potentially the most heart-breaking. Zander, I had my doubts about as I was never sure he was truly interested in Flo. Although the plot isn't predictable per se, it's lovely to see how the characters all end up crossing paths and why they're linked. I was saddened a little by the twist, as it could have happened to a better character in my opinion, but I'll leave you to make your own mind up. One overwhelming thing I did take from this book is that I hope it will make more people join the organ donor list. If you're not yet signed up, would you consider it? It's a really good read - would definitely recommend it! there is nothing wrong with liking chick-lit, a good heart warming, life affirming book is as good as any other. I'm sure I've read some Jill Mansell but I can't buy anymore books until I've made a visible dent on my to-read pile!! I've promised myself no new boooks this year, but the pile I need to review is getting larger and larger so I'll never run out of things to review. Caffeine-fuelled and drawn to a quirky print to add to the wardrobe zoo. Shoeaholic, dressmaker, Girlguiding volunteer and Queen's Guide. Keen reader and book reviewer. Tortoise owner. Adores dinosaurs. Probably has enough shoes to wear a different pair each day of the year. She wants to dance like Uma Thurman..
A pirate's life for me..
Sunday Shoes 070: Irregular Choice Trixy..
All we really are is squirrels..
Sunday Shoes 069: Irregular Choice Baby Mine.. Shake it like a pom pom..
Layer up, it's good for you..
Sunday Shoes 068: Boden Alice heels..
All products that are featured on t*rexes and tiaras were purchased by myself unless stated otherwise. As of May 2012, any PR samples, items that have been gifted to me or similar will be marked with an asterisk (*), and made clear in the post. Items that have been given to me for free will never affect my reviews. All thoughts and opinions expressed on my blog are 100% my own and always will be. My blog is nothing if not honest.